It is important to note that the Hakka are not among China’s 55 resident ethnic minorities, but are in fact a subgroup of the Han ethnic majority. They are distinguished from Han people by their language, their unusual architecture, and a few other quirky cultural traits. The term Hakka or “Kejia” (客家) means “guest families” and was initially coined during the Qing Dynasty (1644-1912) in reference to people or “guests” who had left their homelands and settled in other parts of China. The Hakka earned this unusual title because, over a period of more than a thousand years, they were subject to a series of approximately five forced migrations. So if you thought moving house was hard, imagine moving your whole extended family five times over! They are believed to have originated from northern and central China, primarily from lands bordering the Yellow River that now make up modern-day Shanxi, Henan and Hubei. However they were forced further and further south due to political unrest and nowadays the majority of Hakka people can be found in the provinces of Guangdong, Jiangxi, Fujian, Hong Kong, Guangxi, Sichuan, Hunan, and Hainan. It is estimated that the population of Hakka people in China is now over 31 million, with 60% of the world’s Hakka population residing in Guangdong. They have successfully emigrated out of China and now constitute approximately 15% to 20% of Taiwan’s population, making them the second largest ethnic group in that country. They can be found not only in Asian countries such as Malaysia and Thailand but also further afield in Canada, Australia, the United States and throughout Europe. Their language, known as Hakka Chinese, incorporates features of both Mandarin Chinese and Cantonese so many people regard it as a bridge between these two languages. It is considered one of the oldest languages in China and has remained largely unchanged for hundreds of years, although some people argue that it is a dialect of Chinese. As if that wasn’t confusing enough, there are a number of dialects within the Hakka language, of which Meixian Hakka is considered the standard. In some parts of China and Taiwan, the constituency of Hakka people is so large that some televised news-broadcasts are done in Hakka Chinese! 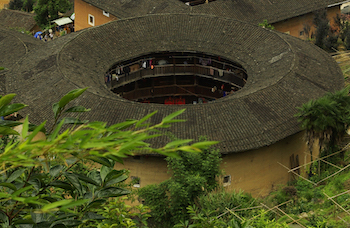 They have become renowned for a special type of building known as a Tulou, which can be found throughout southwest Fujian, Jiangxi, and Guangdong. These buildings are usually round or square in shape and can be several stories high. They are essentially fortresses and the larger ones resemble fortified villages! They were initially built to protect inhabitants from bandits and wild animals but are still in use today. After all, you never know when a marauding panda might come sniffing around! These earthen structures are considered so unique that a representative sample of about 10 Tulou in Fujian were made a UNESCO World Heritage Site in 2008. 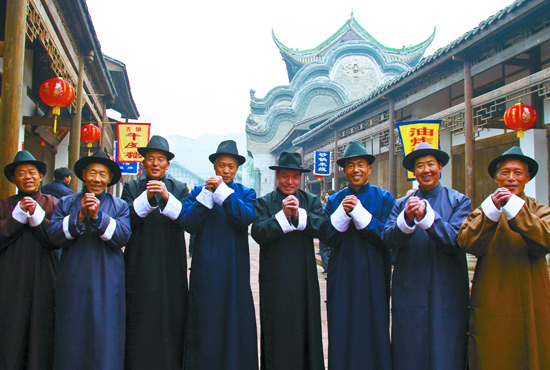 As far as religion is concerned, the Hakka people’s beliefs are almost identical to those of the Han Chinese. Their primary form of religious expression is in ancestor worship and they tend to follow a mixture of Taoism, Buddhism, Confucianism, and folk religion, much like the Han. Politically speaking, the Hakka have had a huge impact on Chinese history and many famous political figures were of Hakka descent. Luodai Ancient Town in Sichuan even has a museum dedicated to the Hakka people and is reputed to be the greatest Hakka town in western China. Meizhou City, in Guangdong Province, is considered the largest Hakka city all over the world. @ Tansuo CulturalTravel Solution Ltd.